As part of the GATEway trials, a fleet of up to seven shuttle vehicles will run along a 2.5km route round the Greenwich Peninsula, using a dedicated lane alongside a separate shared pedestrian and cycle lane. The GATEway project said the trial aims to demonstrate the use of automated vehicles for what is known as last-mile mobility, ‘seamlessly connecting residential locations, commercial areas and transport hubs by a zero emission, low noise, on-demand transport system’. 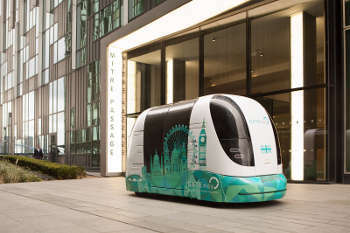 Greenwich council is inviting local people and businesses to sign up to give their views on driverless vehicles via a web-based sentiment mapping tool as part of a series of public engagement activities within the two-year project GATEway project, which aims to investigate the use, perception and acceptance of automated vehicles in the UK. An online heat map has been designed to track any changes in public attitude towards driverless vehicles during the project. Contributors can revisit the site as many times as they like, adding multiple comments. As well as assessing people's attitudes towards driverless vehicles, contributors will also be asked where they think such vehicles would and wouldn't work within the area. GATEway is part of Greenwich Council's integrated smart city strategy launched in 2015, which sets out its plans for using the latest technologies to meet the needs of its growing population. Last month Transport Systems Catapult carried out the first trial of self-driving vehicles in public in Britain.